Summer is here, the days are long and warm and it's time for outdoor cookouts! Bring something special to your summer get-togethers this summer -- yummy homemade cheeses like chevre or fromage blanc, super-easy to make with our direct-set cultures. Or, really wow your friends and family with homemade haloumi -- a recipe is below. Top it all off with homemade wines, like the Limited Edition French Rose that you can serve in the nifty chiller decanter included with every kit purchase! Contact us today to make an appointment to get your summer wines started. Grill something unique this summer -- your own homemade haloumi! Haloumi (also spelled halloumi) is a unique cheese that won't melt when heated. It is traditionally made with goat or sheep milk, but you can make a great version with cow's milk from any grocery store -- as usual, just avoid ultra-pasteurized milks! 2 gallons whole cow or goat (or mix) milk -- avoid ultrapasteurized! Add the calcium chloride to the milk and heat the milk to 86° F. Add the mesophilic culture. Let rehydrate on the warm milk for a minute or 2, then stir into the milk. Add the rennet and mix in with a gently up-and-down motion, do not stir vigorously. Cover the pot and hold the milk for 45 minutes to one hour, until a clean break is achieved; this curd will be very soft. Cut 1/2" curds as uniformly as possible. Slowly heat the curds to 104° F, raising the temperature about 2 degrees every 5 minutes for about 45 minutes total. Stir the curds very gently every few minutes to prevent matting. Once you reach 104° F, hold the curds at this temperature for another 20 minutes with gentle stirring. Ladle the curds into a colander lined with good cheesecloth placed in a bowl to catch the whey that drains off. Pour the whey back into a pot and reserve for later. Pack the curds into a cheesecloth-lined mold and press with 30 pounds for 1 hour. Take the cheese out of the mold, unwrap and flip over, then rewrap in the cheesecloth and press again with 50 pounds for 30 minutes. Remove the pressed cheese from the mold and cut into 2" thick slices. Heat the reserved whey to 180-192° F. Put the slices into the heated whey and cook for 1 hour holding the target temperature. 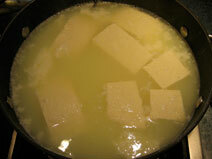 The cooked cheese should float to the surface of the hot whey. Drain the strips in a colander and let rest there for about 20 minutes. Sprinkle liberally with 1/4 cup cheese salt and let cool in a pan or dish at room temperature for 2-4 hours. You can store the cheese dry or put into a saturated brine made of pound of non-iodized salt (cheese salt or kosher salt) dissolved in 1/2 gallon unchlorinated water. Store the cheese in the refrigerator for up to 60 days; the flavor with increase over time, but you can eat or grill your haloumi any time during that period. In association with San Diego Amateur Winemakers' Society, Curds and Wine will be hosting bi-monthly home winemakers' seminars. These seminars are held every even numbered month on the third Saturday at 1 pm, although this month's seminar is moved one week. Seminars are given by Lum Eisenman, a winemaking guru that we are lucky to have in the San Diego area. Lum will share his expertise on various winemaking techniques and issues. This month Lum will give talk about "The Big Stink," when things go awry in home winemaking. 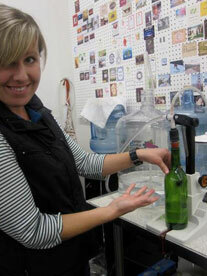 Bottling your wine is even more fun with the Enolmatic vacuum bottle filler! This bottling pump quickly and efficiently fills your bottles -- it can fill over 200 bottles an hour! 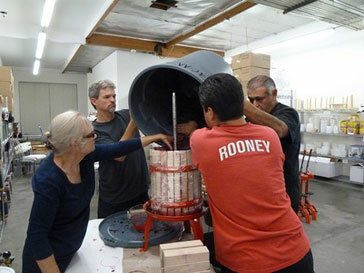 We routinely bottle 6-gallon batches of wine solo in less than 20 minutes with the Enolmatic. Get yours today at Curds and Wine for $425. Contact us if you are interested in purchasing one of these units. Harvest 2012 is just around the corner, and we have everything you'll need at Curds and Wine! In addition to supplies and equipment rentals, we will be offering two sets of Winemaking from Fresh Grapes Courses this year. Our Grapes-to-Glass Hands-on Winemaking Course has already sold out for Harvest 2012, but we also offer the Basic Winemaking from Fresh Grapes 3-seminar series to teach you all the basics of making wine from fresh grapes. Seminars start this month and continue through August, with Hands-on classes extending through October. We are taking preorders for Vadai Hungarian barrels. A variety of sizes are available for wine, beer, or vinegar. You can find available sizes and a price list on our website. Preorders will require a $50 non-refundable deposit. Please contact us with your name and a phone number for contact, but do NOT include any credit card information. You can also place preorders at the shop. Preorders must be placed by Sunday, August 26th so that we can get the barrels in stock for harvest season.